From physical exercise to mental wellbeing, the love of maintaining an aesthetically beautiful outdoor space to the joy in nurturing new plant life and perhaps even growing wholesome food for your cupboards, there are countless reasons that humans have always been drawn to gardening. For some it is a necessity, others a hobby, and others it is a form of therapy. Often it’s all of the above. This age old pastime is not something your disability needs to stand in the way of you enjoying for yourself. 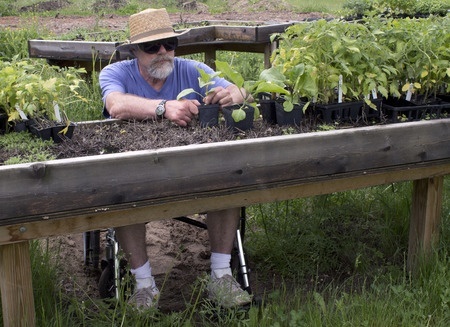 While your wheelchair may present certain challenges that able bodied gardeners are unaffected by, there are steps you can take to design or adapt your space and create a user-friendly garden and toolkit that takes your personal needs into account. What do you want in a garden? Consider the space you have to work with, and what you ultimately want to get out of your garden. Is your goal to have an aesthetically pleasing piece of land that demands as little maintenance as possible – a space you can relax in and enjoy with minimal requirement for ongoing work? Or do you want to develop an outdoor space in which you can indulge your creativity and work on as an ongoing project? These are the first questions to ask before embarking on your garden design or adaptation. The more level spaces there are in your garden, the more of it you can safely enjoy. If the surface of your garden is too uneven, it is worth hiring the services of a landscaper to help you level more areas off. With any unavoidable level changes in gardens, consider having ramps installed – ideally at a gradient of 1.15 – to enable ease of access. Any pathways should be no less than 80 cm wide as a minimum, but a width of 1m or more is recommended to allow for safe passage and manoeuvring. The gradient of your pathways should be no higher than 1.2, but the flatter the better to provide optimal safety and ease of use. Pathways should have a flat surface covering. Materials to consider are concrete, cement, tarmac, wooden decking (though caution should be taken in the rain), or correctly laid levelled off bricks or paving slabs. Surfaces made from chippings, bark, gravel, pebbles, cobbles, or unevenly laid bricks and slabs are better avoided by wheelchair users. It is a good idea to design the layout of your garden with energy conservation in mind. Gardening is a physically consuming pursuit for anybody, so the less energy you have to expend on getting around and accessing your plants the better. Design the layout of your pathways to flow with the areas of your garden and enable your easy access to as many different parts as possible. Great options for wheelchair users to improve ease of access to plants include raised flower beds, vertical wall gardens, hanging baskets, planting tables and ornamental pots and planters. All of these can be designed and installed in a beautifully aesthetically pleasing manner, either by the budding DIYer or by a professional gardener. Gardening tools with a long reach and easy to grip handles are best suited to many wheelchair users. Moving things around the garden need not be too much of a challenge. Consider purchasing a one handed wheelbarrow or a lightweight barrow on twin wheels, or even simply large flexible buckets, depending on what you feel most suits your needs. Sticking to softer, lightweight soil will make the chore of digging significantly less energy consuming. It is a good idea to have an easy access tool storage area near to the door of your home.